Preparation time: 15 minutes ; Cooking Time : 10 minutes. In a bowl take whole wheat flour, add salt, oil 1 tbsp and water. Mix and then knead into a smooth soft dough. cover and keep the dough aside. 2) Chocolate stuffing - Take a bowl and add chocolate blocks and melt it. Grind cashew nuts and almonds, make it coarse paste. Add this paste to chocolate bowl. Mix it well and this stuffing is ready for chocolate paratha. Take a wheat flour dough, and make an equal portion balls from dough and take one ball, flatten it, roll it 3 to 4 inch diameter circle with the help of pin. Put the chocolate stuffing inside and seal it by gathering the edges into the center. Flatten it using hand and roll into 6 - 7 inch circle. Use wheat flour to make rolling easy. Now heat the frying pan to fry the paratha. 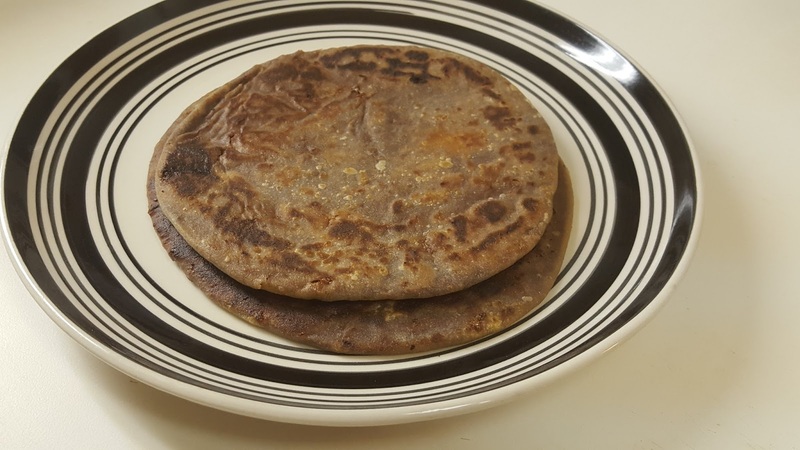 Fry paratha, apply butter on both the side of paratha, fry them till both the sides gave golden brown color. And here Chocolate paratha is ready to serve. Chocolate is rich in fiber, iron, magnesium, copper and is a powerful source of antioxidants. Flavanols from Chocolate or cocoa can improve blood flow to the skin and protect skin against sun induced damage. Cashew nuts lower blood pressure with the help of magnesium present in it. Helps in weight loss and helps in digestion. Almonds are best sources of Vitamin E. which helps lower rates of heart disease, cancer. They are high in magnesium, which helps to assist blood sugar and blood pressure control. Per serving - Chocolate stuffing 124 + Dough ball 120 = 244 calories. 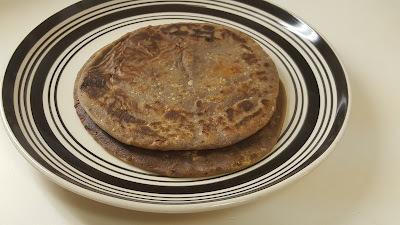 Chocolate paratha is good to eat for breakfast or evening snacks.